Is This Time Any Different? Or Did We Forget What It's Like? My nephew recently turned 5 years old. My younger brother and his wife were visiting from California at the time and suggested taking him to Chuck E. Cheese for his birthday. I remember going there when I was younger and thinking it was such a fun place. However, I no longer had that same feeling after my recent visit. I remembered it being gigantic, with arcade games as far as the eye could see. Yet, during my visit, I realized I could walk the entire length of the building in about twenty strides. The selection of games was limited and seemed very archaic, given current technology. I was unimpressed to say the least. My nephew, on the other hand, had a great time. That's all that mattered. After speaking with multiple adults who have frequented Chuck E. Cheese over the years, it became clear that my memory was inaccurate and not much had changed. It's quite funny how we remember things to be different than they truly are. Quite often in investing, we tend to base our future expectations on somewhat recent events. Those who began investing at the end of 2009 had the Great Financial Crisis of 2008 still fresh in their mind. Hesitation and fear were present. Those who started in 2018 had the rally of 2017 as their investing expectation. Euphoria was the main driver. Reality is slightly different than we like to imagine. Every major decline and rally have their own catalyst. They may not be identical but can share similarities. There have been numerous double-digit percentage drops in the stock market throughout history. There have also been multi-year rallies. However, we tend to reflect on what is recent in our minds. We emotionally react with those feelings and tend to forget that many times it's not all that different this time around. I have heard multiple people mention that the recent volatility is out of the ordinary. For my own curiosity, I wanted to take a minute to look at a few different periods in which we were in a bear market and see if this time is truly different. Bear markets are defined as a fall of 20% or more from recent highs. I personally think this definition is somewhat arbitrary, but that is the definition. Because of our recent 20% drop in the S&P 500 from all-time highs, I'm comparing similar conditions historically. We may simply feel like it is extra-volatile because it comes on the heels of a year such as 2017. Let's take a closer look. 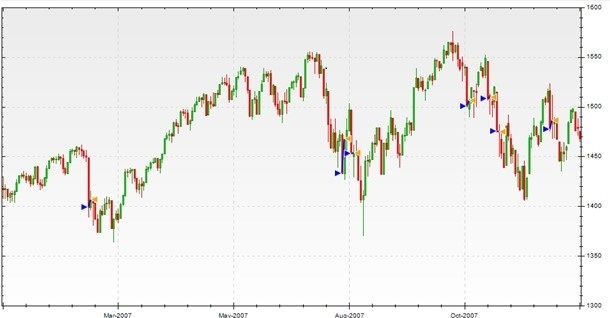 7 trading sessions in 2007 had a drop of 2.5% or greater in the S&P 500, from the close of one trading day to the close of the next. These days are marked by the blue triangles on the top chart below. In 2007 we had a greater than 19% decline in the S&P 500 approximately 70 trading days after the October high. This can be seen on the bottom chart directly below. 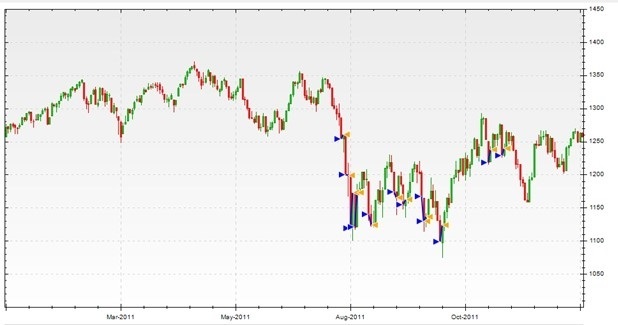 12 trading sessions in 2011 had a drop of 2.5% or greater in the S&P 500, from the close of one trading day to the close of the next. These days are marked by the blue triangles on the top chart below. In 2011 we had a greater than 19% decline in the S&P 500 approximately 68 trading days after the May high. It took approximately 107 trading days to drop another 1%, making it greater than 20% from May's high. This can be seen on the bottom chart directly below. 7 trading sessions in 2018 had a drop of 2.5% or greater in the S&P 500, from the close of one trading day to the close of the next. These days are marked by the blue triangles on the top chart below. 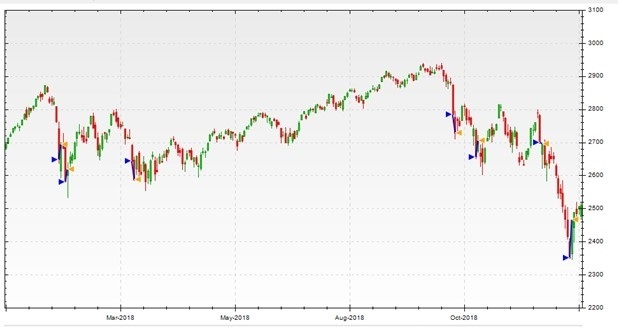 In 2018 we had a roughly 20% decline in the S&P 500 approximately 64 trading days after the September high. This can be seen on the bottom chart directly below. As we have seen from the time periods listed above, there tends to be some similarities. There often was a similar amount of large single-day sell-offs. There were slightly more in 2011, which had a large cluster of volatile days in a short period of time. Also, the time it took from the peak to reach a 19 to 20 percent drop were quite similar. All three of the above-referenced years saw that drop occur in a window of 60 to 70 trading sessions. I realize that there are many other years I could have compared, such as 2010, 2015 and many more. I merely selected these years because I remembered them being extremely volatile and often referenced in the media. I have looked and compared this on the most basic level. If we truly wanted to dig deep into the data and look at the speeds of same-day drops - and much more - I'm sure we could find drastic differences over the years. I simply wanted to look at this from the perspective of the average investor who isn't viewing every single uptick and downtick in the market. My takeaway is: Emotions run high in volatile market conditions and we will forever feel like it's worse than previous times. Yet, it may just simply be that the volatility of 2018 is to be expected in bear markets. I've heard the expression: "Bad things happen in bad markets." That pretty much sums it up in my opinion. Markets go through good times and bad times. Design your portfolio in a manner with which you will feel comfortable in both conditions. If you would like to find out more, click here.